The building at 4565 N. Elston Ave. on Chicago's Northwest Side has a black-painted brick facade and opaque windows. There is no sign, so you would never guess that the business inside is one of Chicago's busiest up-and-coming craft breweries--Finch's Beer Co. The lack of a sign might also make you think the guy who runs Finch's doesn't know the first thing about branding and marketing, but there you'd be wrong about Ben Finch. 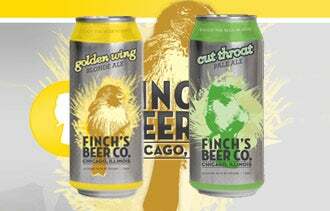 Before getting into the business of hops and barley, Finch co-founded The Killswitch Collective, the cutting-edge Chicago creative agency that has done design work for the likes of MTV. The absence of signage hasn't hurt Finch's Beer. It garnered much local buzz and had a long list of bars awaiting tap handles even before it filled its first keg last spring, thanks to an early, aggressive marketing strategy heavily reliant on social media. "From day one I decided that a lot of the marketing effort would be focused on social media," Finch says. "When you look at how beer brands are marketed, the big ones may do a lot through other media, but that is not an option for a craft brewery. It wasn't an economic decision--it was just the best way for us to build a hard-core following." The social media effort began many months before the brewing, as the company used Facebook and Twitter to build brand buzz, share photos of the brewery's construction phases and give local bars shout-outs through a "Daily Social Love" post, which no doubt endeared Finch's to many would-be partners. To manage its social media activity, the company uses Sprout Social, a platform Finch learned of when Killswitch became one of Sprout's early test groups. Finch digs in to Sprout reports to gauge the company's traction and following, but otherwise keeps the strategy simple. "Social to me is as DIY as marketing gets," he says. "You don't have to have a ton of experience and practice to use it. There's no 'right' recipe. As a small business, you just need to start interacting with your customers." For Finch, social media is just one facet of an old-fashioned marketing philosophy. "We don't have people finding us through social," he says. "They find us through word-of-mouth. If I go to a bar where we're on tap and talk to someone, they become a fan and tell 10 of their friends about us. I'm still a big believer in word-of-mouth." Not having a name on the door is Finch's way of proving that personal interaction with customers is still an important notion. After all, plenty of people have managed to find the brewery--the neighborhood folks who showed up for an informal Memorial Day barbecue Finch announced through Twitter, the throngs who have signed up for brewery tours advertised through Facebook and the beer enthusiasts who have taken a home-brewing class Finch's hosted via community learning marketplace Dabble. "You can put up a sign," Finch says, "but there are so many other ways of reaching people."